And just like that another year has passed. 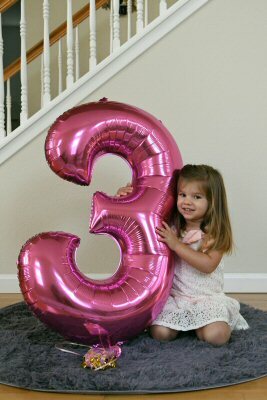 I can’t believe how fast time is flying, or how big my little girl is getting. 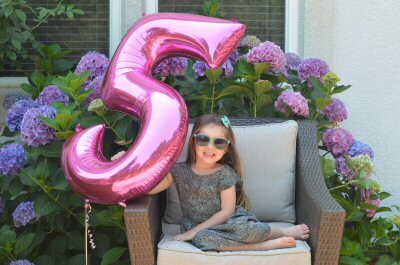 This year we thought it would be fun to kick off her birthday party with a big surprised. 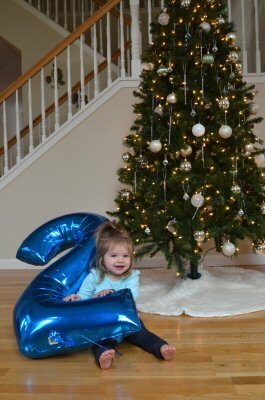 She loves balloons, so what better way to celebrate the big ‘3’ than waking up with a 3 foot high helium balloon? Before going to sleep ourselves, we snuck the giant balloon into her room. Wouldn’t you know it was the first night in weeks she woke up to go potty in the middle of the night? She spotted the balloon instantly and was so excited I was afraid she’d never go back to sleep. She kept talking about the balloon that ‘Santa’ brought. We decided to just go with it. Santa brings birthday balloons now, don’t you know? So much has changed these past couple of months. New home, new daycare, new classroom, new routines. Nicole missed her old daycare (and told us so!) but is adjusting to the new one well. They have a ton of activities, and bouncy castles. We’ve been here about a month and they’ve already bounced in an inflatable bouncy castle twice. I’m not planning on switching daycares any time soon, but if I were, bouncy castles are clearly a new requirement. My most precious memory of this age is the way she expresses herself. For the longest time ‘Sure’ was her affirmative response to yes/no questions. “Would you like a cupcake?” Sure, she’d say with a slight head nod as though her answer was anything less than an emphatic yes. These days ‘little bit’ is her new yes. As in “Are you the cutest thing ever?” Little bit. Little bit, indeed.